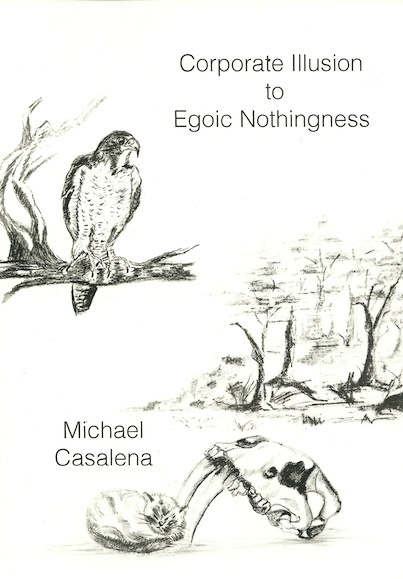 Casalena's non-fiction work melds a millennial coming-of-age tale with a ruthless satire of the literary 'memoir' as a form, creating a space both self-deprecating and wise. Journey alongside the author as he learns what it is to 'live' in corporate America, battles against the forces of societal inertia, and comes into his own personal enlightenment. To order a copy of Corporate Illusion to Egoic Nothingness ($17.00 shipping included) please use the paypal button below! Please allow 1-2 business days to process your order; your book should arrive 2-3 days after the processing date. The Grey Alley is a semi-annual anthology released by Empty City Press showcasing various authors from all over the U.S. This year (2017)'s selection features works by Don Karen Ann, Keith Backhaus, Maggie Cleveland, CD Collins, Donavon Davidson, Jenna Duncan, Meghan Guidry, Daniel Moss, Aaron Tullier, and Lucy Turner. To order a copy of The Grey Alley Vol. 2 ($13.00 shipping included) please use the paypal button below! The Last Place on Earth is a journey into the sediment left behind after a deluge of nightmare and happenstance. It is a confluence of symbol and sentiment, a stare turned inward upon itself, a hesitating look to the half-birthed present. Davidson's work waits in disordered thresholds and lurks at the edges of long, barren paths. To order a copy of The Last Place on Earth ($12.00 shipping included) please use the paypal button below! Please allow 1-2 business days for us to process your order; your book should arrive 2-3 days after the processing date. Enough Said is a narrative collection of poems that trace the discourse of despair, indifference and joy. Potentialities clash against dead memory, leaving the grotesque and the mundane inexplicably linked. Zickefoose's work is a careful and vigorous deconstruction of gain and loss. To order a copy of Enough Said ($12.00 shipping included) please use the paypal button below! In the dis-reality of consciousness, there is only one truth: THE FUTURE IS A MYTH. To order a copy of I, Dagger ($17.00 shipping included) please use the paypal button below! Everything is Conditional Love Poems is a collection of related poems that interweave the mundane and the surreal. An amalgam of deeply worn and deliberately manipulated cliches roil and interweave to create unsettling, eerily apt reflections of the human experience; Davidson's work does more than transform the familiar, it transcends it. To order a copy of Everything is Conditional Love Poems ($12.00 shipping included) please use the paypal button below! The Grey Alley is a semi-annual anthology released by Empty City Press showcasing various authors from all over the U.S. This year (2015)'s selection features works by Keith Backhaus, Michael Casalena, D'Metrius John Cauthorne, Donavon Davidson, Tuvia Dulin, Jenna Duncan, Meghan Guidry, Alicin Mack, Suzanne McDonald, Megan Rippey, Benjamin Stoehr, Aaron Tullier, and Chris Zickefoose. To order a copy of The Grey Alley Vol. 1 ($14.00 shipping included) please use the paypal button below! Afterheat is the term for extreme temperatures generated by nuclear explosions and nuclear reactors. It is a persistent heat that must be removed now and a year from now. Dangerous and explosive, it is a fire that cannot be put out. Like memory. To order a copy of Afterheat ($16.00 shipping included) please use the paypal button below! Ages or moments, it hardly matters. What to do when cast adrift in a vast ocean? What to do when survival comes at the price of one's own sanity? The world is different now, but when is now? A man wakes but with one burning memory: a war that unmade the world, that ended reality itself. So what then, is this? An ocean populated by dreams, forests without end, a vast desert that swallows time itself--these are rumor manifest, truths that seem familiar and yet so alien. Beyond them: crawling cities, ancient empires, labyrinthine cosmologies. Each builds upon the other, cancerous and insatiable. Truth is somehwhere on the next horizon, or it is drawn bloated and dead from the sea. The past is a myth that no one seems to believe; the future is an unfulfilled prophecy that cannot be true. Between are the all too familiar struggles for power, loves caught in complexity, the peace at the center of the heart. Can a traitor be made whole again? Can a killer be redeemed? Can a liar be believed? Life is a maelstrom. In the center, a man walks. The world turns with him. To order a copy of A Fitting Epilogue ($22.00 shipping included) please use the paypal button below! Among the crumbling tenements, beneath a mustard-yellow sky, something in Radnor is waking up. The war limps on, half-dead and dazed. A fever sweeps through the crowds, picking away at the weak, the infirm. Ideas and memories swirl through the thick air. Mosquito wings whisper blasphemies into the ears of the faithless population. But something somewhere is waking up. In a child-brothel a boy pulls words through skin while a priest of empty faith seeks more than salvation. Across town, a painter rots in regret. Each resonates with a secret language, an axiom that will come to define an era. To order a copy of Axiom: Radnor Year One ($20.00 shipping included) please use the paypal button below! Copyright © 2008-2017, Empty City Press. All rights reserved.